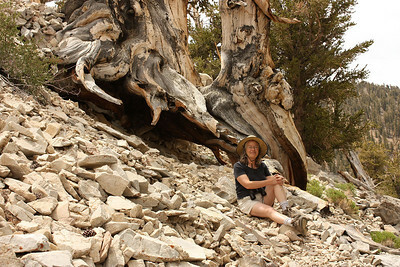 The oldest living tree currently known is a Great Basin Bristlecone Pine growing in the White Mountains of eastern California. This tree, which is over 4800 years old, was born at the dawn of human civilization and is still alive and vigorous today. 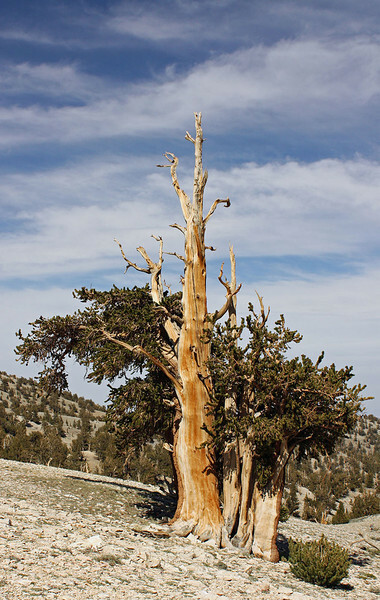 Mas and I went to visit the bristlecone pines, which grow between 9,000 and 11,500 feet (2743 m – 3505 m) in the high mountains of eastern California, Nevada, and Utah. What allows these amazing trees to live so long? Of course, there is no single answer, but a big factor is simply that bristlecone pines can thrive in conditions that would kill any other tree. The bristlecones grow widely separated from each other, like a display of natural bonsai art, accented by small alpine plants. Because they grow in rocky, alkaline soil in a dry, cold climate with an extremely short growing season, they have no competition from other trees and shrubs for the little available water, and are also isolated from insects, fungus, and fire. They can survive extensive damage to one part of the tree. Over time many parts of the tree will die – the soil slowly erodes away killing a root, lightning strikes the top, the climate warms allowing insects to attack a branch. Each injury shows itself in arresting visual patterns as the live veins twist around the dead wood. The trees that grow the most slowly, in the harshest environments, are also the oldest. 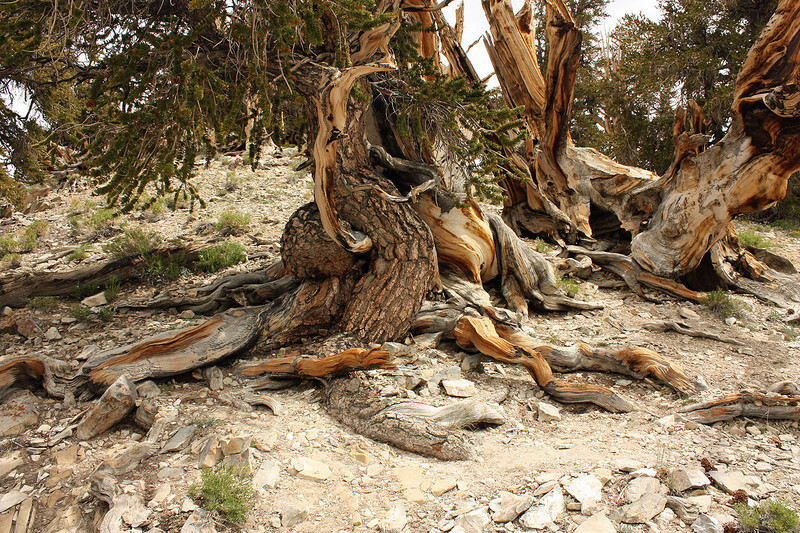 The bristlecone’s wood is full of pitch, which protects it from insects and fungus. The more slowly they grow the denser their wood is and the tougher they are. Even after death the tree will remain standing in the ground for thousands of years. We returned home with deep admiration for these magnificent trees and their ability to survive thousands of years in such harsh conditions. The bristlecone pines, in their lonely endurance and dignity, teach us the deep meaning of the art of bonsai and the eternal dance of life and death. Click this picture for more photographs of the bristlecone pines and landscapes and wildflowers of the White Mountains. California is full of incredible sights that attract visitors from around the world, and among them are the tallest, the biggest, and the oldest trees on earth. The tallest trees in the world are the Redwoods, which grow in the coastal mountains from Big Sur north. The biggest trees however are the Giant Sequoia that live on the western slope of the Sierra Nevada, and the oldest trees are the Great Basin Bristlecone Pines that are found in the high country of eastern California. Mas and I took a small trip earlier this month to visit the sequoia and the bristlecone pines. 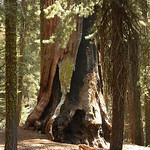 We started with the big trees of Kings Canyon and Sequoia National Parks in the central Sierra, south of Yosemite. These parks encompass an incredibly diverse set of environments, ranging from the dry foothills at 1,700 ft (518 m) to the top of Mt. Whitney at 14,505 feet (4421 m). 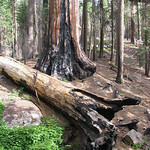 The sequoia grow between about 5000 and 7500 feet (1524 – 2286 m). If a sequoia is lucky enough to find itself in a good spot, it can live for a very long time and reach an enormous size. 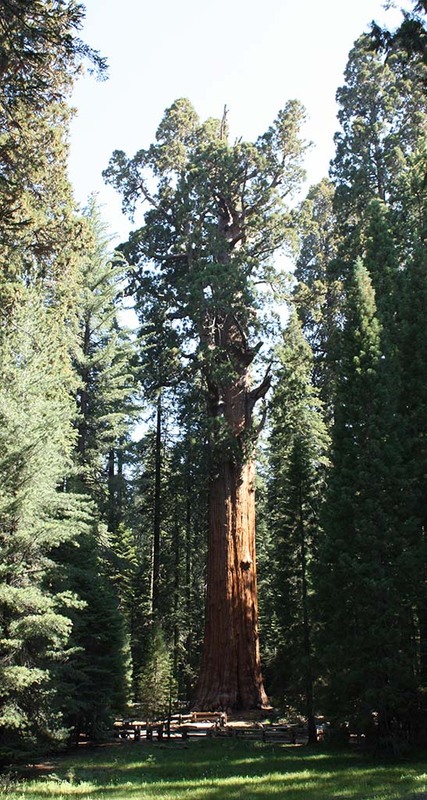 The largest single-trunk tree on earth is the General Sherman tree, in the Giant Forest grove of Sequoia National Park. It is over 2000 years old, 275 feet tall (84 m), and has the biggest trunk by volume of any tree in the world. Such a giant sequoia needs solid, undisturbed, land that can support its weight for many centuries. Its foliage needs plenty of sunlight in order to create energy for the tree’s growth, and its roots need good, mineral-rich soil with sufficient moisture. As is often said about real estate – it’s all about “location, location, location”. Fire is the key to the sequoia’s ability to live long and prosper. The forests where the sequoia grow will naturally burn every 10 years or so. This adds minerals to the soil, and clears out all of the undergrowth and small trees that would otherwise compete with the sequoia for moisture and sunlight. The heat from a forest fire opens the sequoia cones, which then drop the seeds to the freshly prepared soil. The young seedlings will grow quickly in this rich environment, pushing their heads toward the sun and sending out wide, shallow roots to gather moisture from the soil. They will be well-established by the time the rest of the forest grows back. As the tree matures it develops a beautiful cinnamon-colored bark. The bark, which is extremely thick, will provide insulation and protection from insects, disease, fire, and cold. Lightning may strike and burn through the bark and even the heartwood, but as long as a thin “lifeline” of the inner bark and cambium layer remains, transporting water and nutrients between roots and foliage, the tree will continue to live. After about 1500 years or so the tree will enter old age and become what is called a “monarch”. These are the massive trees that dominate the groves and cause visitors to lower their voices as they enter the mysterious, silent world. Eventually, as with all living things, the tree will die. Soil erosion and accumulated damage from fire, insects and disease will damage the shallow roots, the tree will start to lean, and one day a storm will finally push it to the ground. 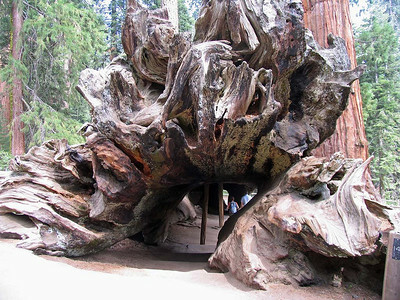 The heartwood of the giant sequoia is imbued with tannin, which gives it the characteristic “redwood” color and protects it from insects and fungus. It will take many centuries for the wood to slowly decompose. Walking among these ancient trees, we felt an upwelling of wordless joy. The sequoia forests have a quiet, peaceful atmosphere, with the shaded undergrowth, the flowering dogwoods, the pine, hemlock, and fir – and standing over them, protecting, shading, and nurturing, are the old monarchs with their gentle, powerful, dignity. Despite tremendous age and the “ravages of time”, the giant sequoia retain their vigor and life force to the end. Clicking on any photo will take you to a gallery of more pictures. 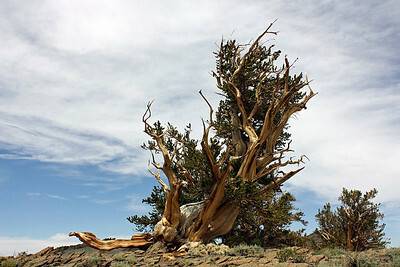 Our next article will be about the oldest trees on earth, the Bristlecone Pines. 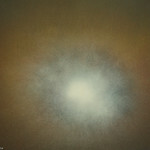 You are currently browsing the Suiseki Art blog archives for July, 2008.